6.70 points at 23 votes (rank 444). You let yourself get attracted upwards by the beam by standing right below it. You wait until the beam is switched off again. If you choose the first possibility, you should not shoot the enemy which carries you around inside the formation as you will also kill your own spaceship and only get 1000 points. You need to wait until the enemy is in flight with your ship, then you can shoot it. Your spacehsip will be set free and you can go on firing with two ships at the same time, which sometimes is very helpful in the bonus levels. 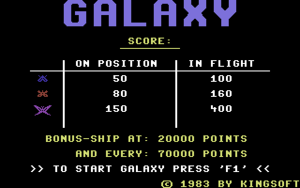 You get an additional spaceship when reaching 20.000 points and every further 70.000 points. 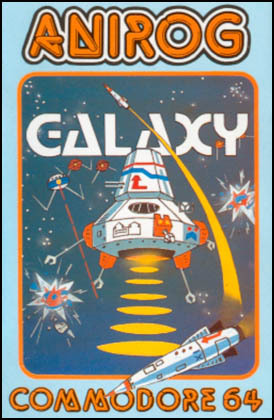 The game is over when your last ship has been destroyed or your spaceship has been attracted by a tractor beam and you have no further spaceship. 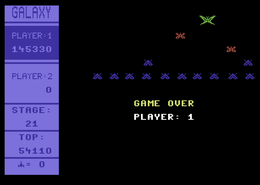 2D game area, at the left the scoreboard with the display for score of player 1 and 2, the stage number, the top score and the number of spaceships left. At the right: game area, bottom the own spacehsip, top the variously coloured attackers, which are either in stop position or attack in flight. The sound is kept very simple. After stage 99 comes stag 0 again and the highscore runs over at 999..999 and shows 0 again (see image above: 17 spaceships, Stage 0 = Stage 100, 123.360 points = 1.123.360 points). Controls can be done either by joystick or keyboard. For subtraction of a life you can let yourself get attracted by a tractor beam, to then go on playing with two spaceships at the same time. But if you only have one life left this will mean the instant end of the game! For highscore chasers it is important to know that enemies "during flight" get more points than shooting enemies when "in position". Sledgie: "It is fun, especially if you want to play old arcade classics again. But to reach a score as Worf's you need endurance, much training and of course the time!!! :)"
Guybrush: "No voting from me, as I always hated anything that reminded me of Space Invaders (I don't know why, that's just the way it is)." 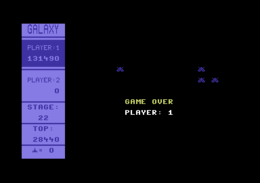 Robotron2084: "Belongs to one of the better ones, that you can find on the C64 about the topic Galaga. Simple but motivating, the way it should be! 6 out of 10 points." Bergo79: "GALAXY was my first game experience with the "Breadbox" at that time. It was top banana, not to be in the need to feed the GALAGA machine with coins. Small drawback: Highscore is not saved. Therefore 9 out of 10 points from me." Galaga in the Killer List Of Videogames. This page has been accessed 6,225 times.